In March 2011 I'll be one of many designers who have their work featured in a indie fashion show in Los Angeles. It's the first time I'll be exhibiting my work, so it's a little bit nerve-racking, but it's a fun project and I get to do whatever I want. Anyhoo, the idea is that the designs I create will be very simple images whose goal is to simply get a yes or no response. You either love it or hate it. That's it. I"ll be sharing more as I go along, but Chimp Cowboy here is the first. Some feedback would be great just to see if my little experiment is on the right track. Dude yes! I need one of these stat. I'm hella excited for you brochacho. I hope for the best, I know you'll will be the talk of the show. I'm loving your John Wayne's nephew, chimps love cowboys, pilgrim. Let me buy one dude. Very cool, though I don't think I'd wear it, but then I'm funny about what I wear on my chest. When's the show? Second week of March I believe. It was originally next month but they found a bigger venue and moved it to 2011. 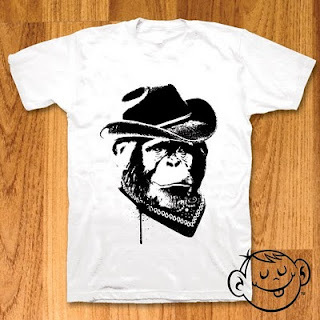 So geeky statements you'd rock on a shirt, but not a cowboy monkey? What a shame.